There was yet more glory for Egypt on the final day of the 2018 Youth Olympic Games as Ahmed Elgendy teamed up with Gu Yewen of China to win the Mixed International Team event. 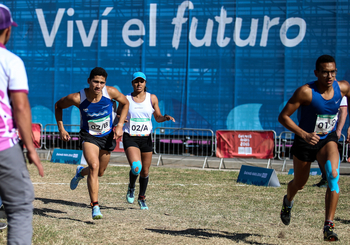 The unique format, enjoyed today by IOC President Dr Thomas Bach among thousands of spectators in Buenos Aires, allows athletes from different nations to team up and battle for Youth Olympic glory – and it was no surprise to see the gold medal go to two athletes who finished 1st and 4th in the individual races. On Sunday, Elgendy (EGY) added the Men’s Individual title to his UIPM Junior and Under 19 crowns, 24 hours after Gu (CHN) had finished one place off the podium in the Women’s Individual event. In the mixed event they went into the Laser Run with a 12sec lead over Elgendy’s compatriot, Women’s Individual champion Salma Abdelmaksoud (EGY), and her partner Franco Serrano of Argentina. To the delight of the home supporters, Serrano (ARG) & Abdelmaksoud (EGY) kept hold of their position to win the silver medal, while bronze went to Laura Heredia of Spain and Kamil Kasperczak of Poland. There was no doubt, however, about which team would go home with the greatest story to tell. Thanks to the skill, composure, battling qualities and raw energy of Elgendy and Abdelmaksoud, Egypt finished with at least a share in all three gold medals, as well as an additional silver – the best possible result from a Youth Olympic Games. Elgendy (EGY) said: “I am very happy and proud. I can’t describe it. It’s my second gold medal and I was targeting the individual event, but then I found my Chinese partner and she was very good. “We talked in English and we communicated well. Every competition we have a Mixed Relay but here in the Youth Olympic Games it’s more interesting because we compete with other nations. It only comes every four years and it’s very exciting. Fellow champion Gu (CHN), who became China’s second Youth Olympic gold medallist after the success of Zhong Xiuting in Nanjing in 2014, said: “I am super happy to get this gold medal. It was a great experience to have the same goal and to share this with someone from a different country. Silver medallist Serrano (ARG) said: “I feel very happy, very proud, because all my family and friends attended this tournament. They came here every day of the competition. Fourth place went to Emma Riff of France and Giorgio Malan of Italy, with Annabel Denton of Great Britain and Zhao Zhonghao (CHN) finishing 5th and Katsiaryna Etsina of Belarus and Adil Ibragimov of Kazakhstan rounding out the top six. With a full house in the Natatorium including IOC President Dr Bach, the best time by far (1:57.06) was set by the all-European duo of Riff (FRA) – Women’s Individual silver medallist – and Malan (ITA). Abdelmaksoud (EGY) & Serrano (ARG) were second-quickest with 2:00.31 while Ana Rocio Aragon Ortiz of Guatemala and Keaan van Venrooij of South Africa were close behind on 2:00.68. A high-class performance by Elgendy (EGY) & Gu (CHN) put them in the driving seat in the battle for gold. They scored 33V/11D and went on to add two points in the Bonus Round to secure a significant lead in the Laser Run. The next-best performers were Heredia (ESP) & Kasperczak (POL), who scored 31V/15D, one more victory than Abdelmaksoud (EGY) & Serrano (ARG). Two of the best young female pentathletes in the world created the gripping spectacle of a duel during the first half of the Laser Run. First it was Abdelmaksoud (EGY) who clawed back at the 11sec lead of Gu (CHN), and the individual champion took the front after the second shoot, only to find her rival coming back during the final 800m. 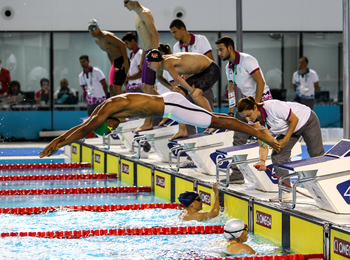 Gu (CHN) gave everything in pursuit of Abdelmaksoud (EGY) and finally the two athletes reached the handover at the same time, setting up a thrilling finish for their male partners – one of whom had the backing of almost everybody in the stadium. 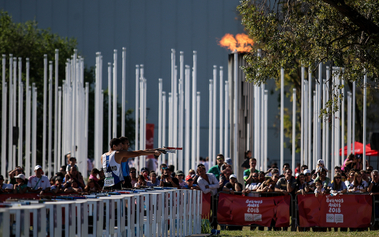 Serrano (ARG) never lost his composure, despite the burden of expectation as fans in Buenos Aires roared in hope of their first medal of the pentathlon competition. But Elgendy (EGY) has been almost unbeatable throughout 2018 and proved once again he has the perfect combination of power, stamina and nerve to close out victories in Laser Run. 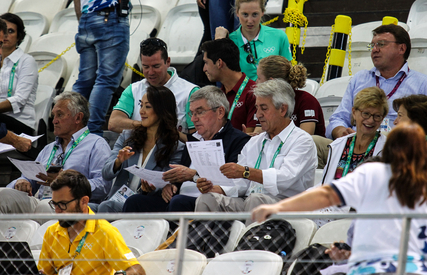 UIPM President Dr Klaus Schormann said: “For the third time, we have enjoyed the wonderful spectacle of an international Mixed Relay at the Youth Olympic Games and we saw a super final today. 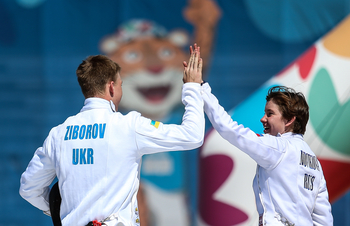 The 2018 Youth Olympic Games pentathlon competition has now concluded. 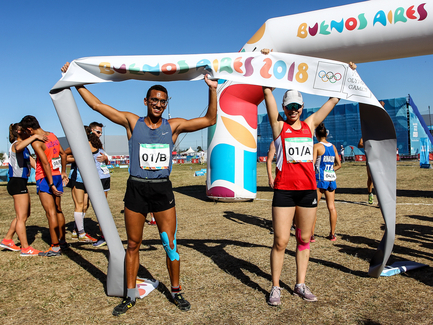 Visit the Buenos Aires 2018 website for all results. The next and final major competition on the UIPM 2018 calendar will be the UIPM Biathle/Triathle World Championships in Hurghada (EGY) from October 25-28.